It was actually difficult to see much of the city for all the greenery. Buildings were obscured by tall weeds and vines and formerly wide boulevards were reduced to narrow sidewalks by leafy trees. Our first stop was the main square, once a vast open space landscaped with beds of roses and neat rows of birch trees and now a tangle of weeds, trees, and moss. 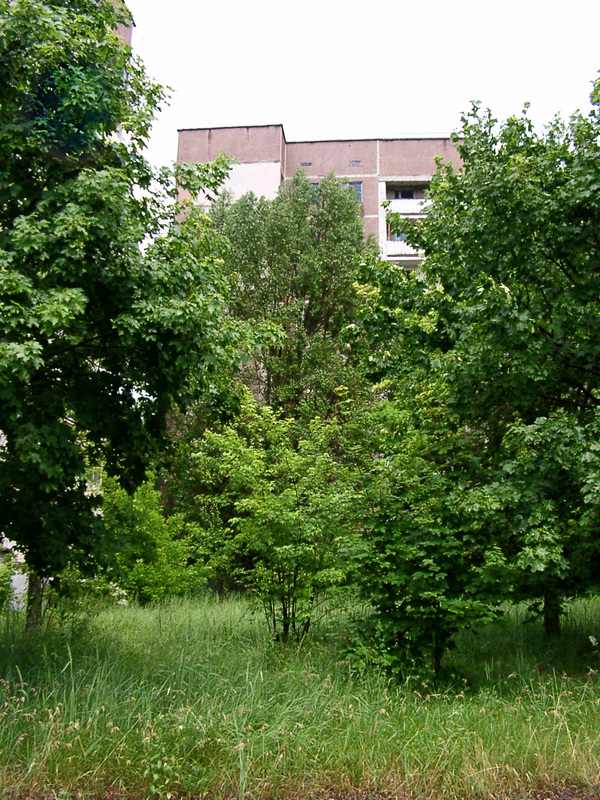 The massive buildings lining the square were barely visible and it was nearly impossible to walk anywhere without getting trapped by a thorny wall of radioactive greenery. This unassuming plain gray building was a restaurant at one time. Here’s another view from further off. Pripyat was a smart, organized city built in 1970 to house all the people who worked in the nuclear power plant (there were four working reactors with an additional two under construction); it of course contained all the things that make up a modern Soviet city: new apartment housing, cafés and restaurants, grocery stores, a hotel, gymnasiums and sporting arenas, schools, hospital, a cultural center, etc. It had close to 50,000 inhabitants, many young families. When the residents were told they must evacuate, it was on the understanding that there was a problem at the reactor and that in the fixing of that problem, something disastrous could happen. They were told that it was temporary and so they left extra food in their pets’ dishes and only packed what they would need for three days. Of course they never came back. Although the extent of the accident and danger was severely whitewashed, I wonder if the government really knew for certain that they would not be coming back ever. 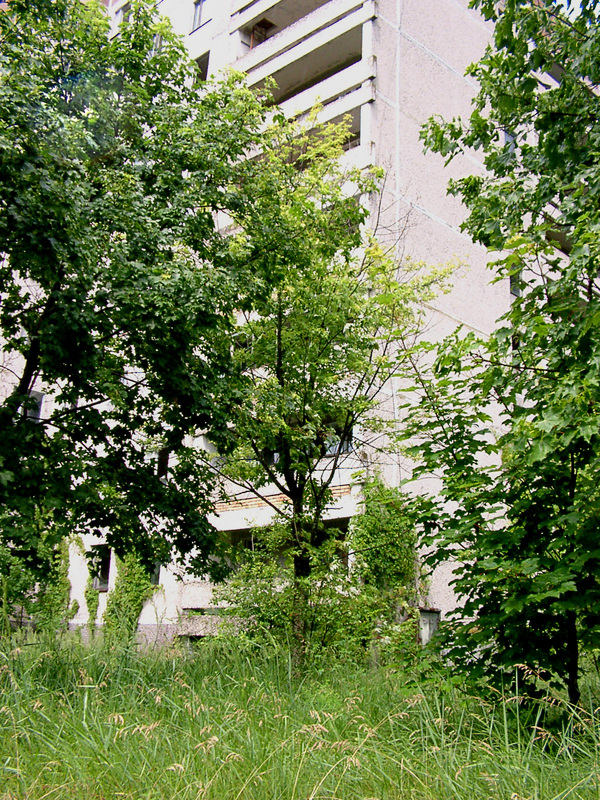 Liquidators tried to actually clean up Pripyat initially, literally washing the town to the extent that they experimented with removing the roof of an apartment building, washing the down the walls, then replacing the roof. Unfortunately, cleaned areas soon regained the high levels of radiation they held previously and the decision was made to abandon the city for good. The accident happened in the last days of April and the city was gearing up for a huge May Day celebration. Rusting decorations hung askew on lamp posts. We were there in June and the city was quite literally being consumed by its own foliage. Trees laden with raindrops drooped over the fractured streets. Flowers and birch trees poked up through crevices in the pavement. Intensely radioactive moss covered everything. Trees grow out of exterior stairwells and on top of buildings, even inside of rooms, watered presumably by the rain that blows through the broken window. We did end up going to Sportivnaya street (this was where our friend Slayer lived with his parents before they were evacuated after the accident). I wandered down the street a little to see if I could spot some clue as to which building he might have lived in (since they, you know, are all so very distinct). He had asked us to take a few photos and so I randomly snapped pictures of buildings I could see. Maybe this was his apartment (the jeep, by the way, was not ours; just some workers doing something inexplicable)? Or this one? Maybe this was it. Slayer actually provided us with an address but as you might guess, it was not possible really to spot exact locations—not that having an address in a Soviet city guarantees success in any case. Quite honestly, I’d have a hard time recognizing my own building after twenty years even if it wasn’t obscured by weeds and leaves. The municipal swimming pool. One very interesting tidbit about this pool is that it actually remained in use for several years after the accident. Reactor workers and presumably liquidators and army personnel used it until it was finally shut down after a failed sanitary inspection (!!!). 1100 buses were brought to Pripyat from Kiev to evacuate the town’s residents two full days after the accident. I have read that the evacuation order took so long because the logistics of gathering so many buses to carry 45,000 people were tricky. However, I also read that the radiation levels were fluctuating a bit initially and that the authorities were not absolutely certain that an evacuation would be necessary. During these two days, residents were exposed to an alarming amount of radiation (it isn’t know exactly what they were but estimates run between 1 and 7 roentgens per hour). It was a warm sunny weekend, people were outdoors, pushing babies in strollers, recreating in the Pripyat river, weddings were going on… No warnings were given by the officials to stay indoors, to keep away from the reactor, to close windows, to wash fallout out of clothing and hair. Many gathered on a railroad bridge, now called the “Bridge of Death,” where they could get a good view of the action over at the plant. Here they watched the pretty glowing fire and received doses of radiation in excess of 500 roentgens per hour. 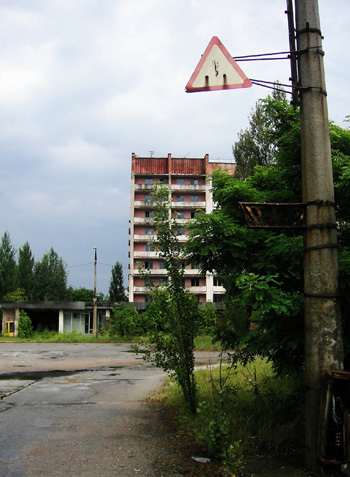 Once the background radiation levels began to increase significantly, the evacuation was ordered and three hours later, Pripyat was essentially empty. Empty of people but not of stuff. Pripyat was a privileged city and from what I understand, it had more than the average share of televisions, radios, fur coats, its grocery stores were well stocked; it was full of stuff. Twenty-five years later, groceries, offices, and most apartments are virtually empty; what remains, if anything, are ransacked piles of useless debris, moldering papers and peeling paint. 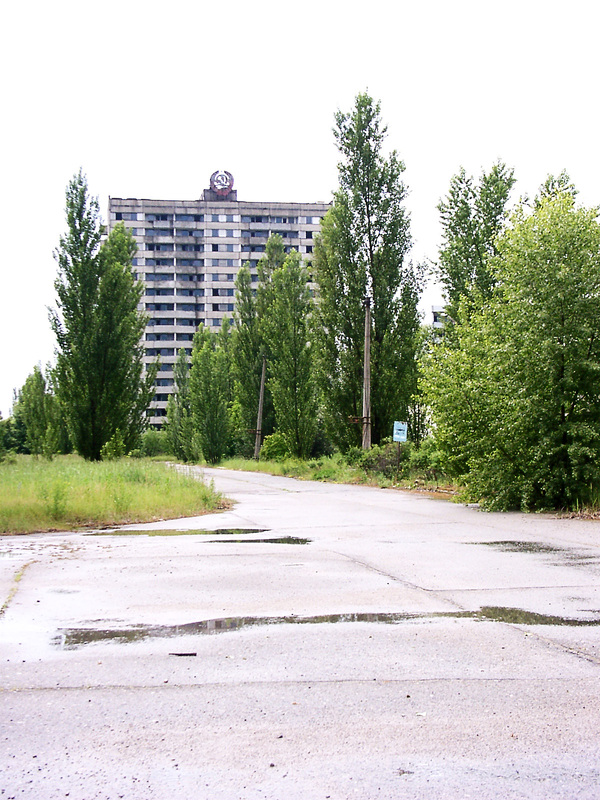 Just what happened to all the stuff and where it went is one of the things I found very interesting about Pripyat. 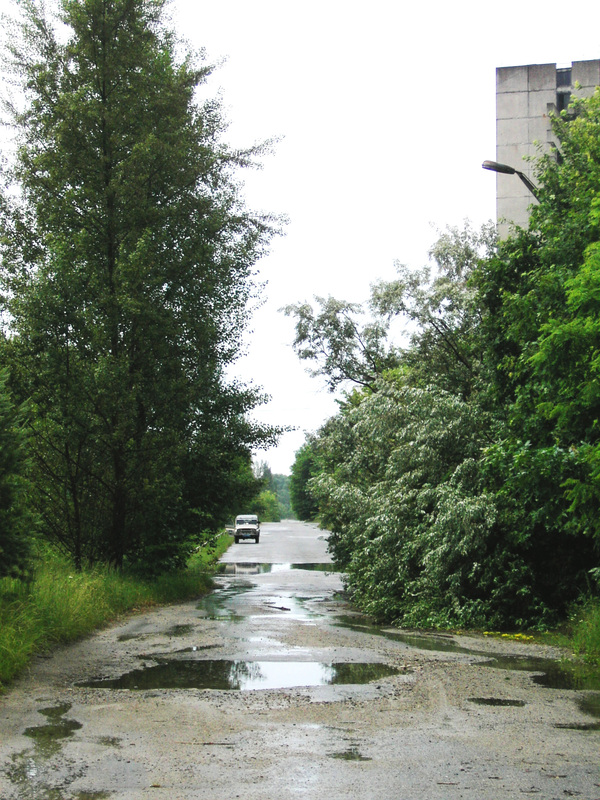 During the first days of the accident and evacuation, many of the people working clean-up or continuing on at one of the other reactors (the unexploded three reactors continued to function as normal and of course required personnel to operate them) returned to Pripyat (probably unofficially) to salvage some of their belongings. I also read that many personal items were gathered by liquidators if possible, washed, and returned to the owners. After that, looting became a big problem. I’ve seen several photos of trucks filled with things like radiators to be sold as scrap metal. Finally, liquidators systematically went through the city removing anything of value to be buried. Of course, I’ve also read that many burial sites have been dug up and emptied by looters as well. The carnival (ferris wheel, bumper cars, swing chairs) that sit decaying in a large open lot (and that are highly radioactive—metal holds radiation extremely well) is one of the more haunting sites in Pripyat. The rides were a gift to the citizens of Pripyat to be unveiled May 1st. Of course, the city was emptied a few days before and so supposedly none of the rides ever got to be enjoyed. This is an extremely interesting video. In 1986, a man came to Pripyat the 26th and 27th of April in order to make a documentary film about nuclear power and Pripyat. All this footage was taken after the explosion and you can see people hanging outside in their summer clothes, pushing babies in strollers, swimming in the Pripyat river. You see the tanks rolling into town, army guys wearing gas masks everywhere (I read an account of a resident who asked the army men why they had gas masks on and was told it was a drill), spraying down the streets. I read that they sprayed special green foam that was supposed to help soak up radiation and which the kids played in (reminds me of the “slow race behind the DDT truck” from Mary Karr’s memoir). One part of the film even shows the glow from the reactor fire. In the very first few images of this video you can see the famous ferris wheel loaded with people. The official reports say that none of the equipment was ever used, that it was to be unveiled on May Day; to have gone up in the wheel would have directly exposed people to radiation from the reactor. But I also read that the authorities relented and opened the Ferris wheel early in order to help foster a calm and festive atmosphere rather than one of stress, panic, or fear over what was going on at the reactor. Toward the end of the video, you can see artifacts of the intense radiation as it affected the film; it looks like white sparkles. 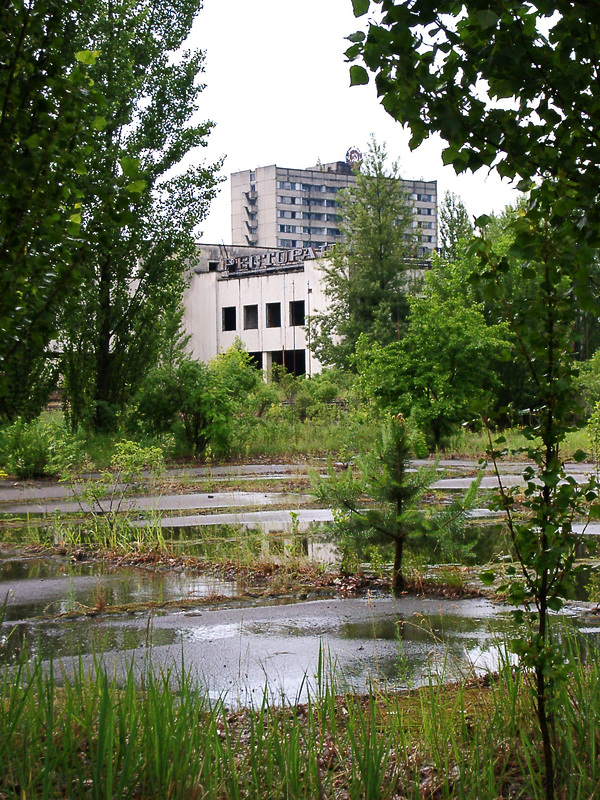 After the carnival, we drove over to the school, one of the other visually intense sites in Pripyat. This dog followed us around for a while after we arrived at the school. He was obviously very friendly and lonely and desperately wanted some scratches or maybe a good belly rub. Unfortunately, we were all fat wusses and wouldn’t touch the poor thing who clearly had been rooting around in the underbrush before coming out to greet us. Rimma (above in the picture) gave him a few pats after which he was our devoted mascot for the duration of the tour through the school. The evacuees were not allowed to bring their pets (not just in Pripyat but those from any of the villages within the 30-kilometer perimeter). People had cats, dogs, farm animals, etc. and they thought they would be back after three days. The intense doses of radiation affected the animals as dramatically as it did the humans and continued exposure made them sick, burned, wretched. A few days later, liquidators were given orders to shoot the remaining dogs and cats they came across. The ones they missed surely died soon after. Animals that were not so close to the reactor and the very hot spots likely went feral if they survived or were adopted by the elderly people who returned to the exclusion zone. This is outside the school and you can see the moss that grows everywhere. It was hard to avoid walking on in some parts but we did our best because moss has a tendency to concentrate radiation (avoiding a chemical shower at the end of the tour was high priority!). I am not entirely certain why this is actually. Moss, lichens, and mushrooms do it, and therefore the animals that like to eat moss, lichens, and mushrooms can be very radioactive as well. 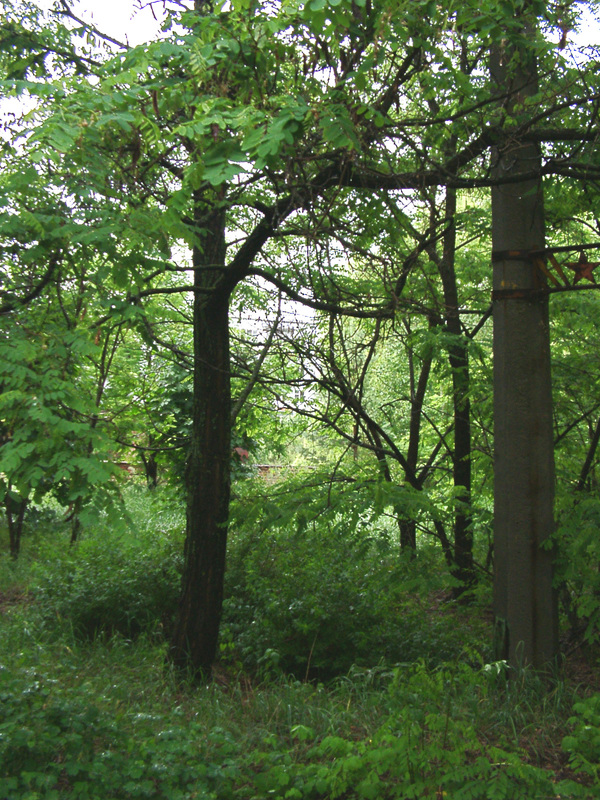 The nature of the photos you see from people’s Pripyat tours is very misleading I feel and yet the photos really do capture the eeriness of the place and the trauma inflicted upon the residents of Pripyat. Over and over again you see images like these from the school showing gas masks strewn all over the place. Draped over cradles alongside trampled toys, littering corridors, etc. The images invoked are tragic, a scene of hysterical fear and haste, trying to get the children to safety, screaming, beloved toys left behind in the confusion. But of course when the evacuation was eventually ordered, it was carried out in an orderly fashion and the entire town was emptied in only a few hours. Before the evacuation, people were told nothing was wrong and when it was ordered, they really believed they would be returning after only a short time. The mess you see in the school and other buildings happened in the weeks and years after the town was evacuated, first by liquidators and soldiers busting down doors to gain access to buildings and later by looters and vandals. 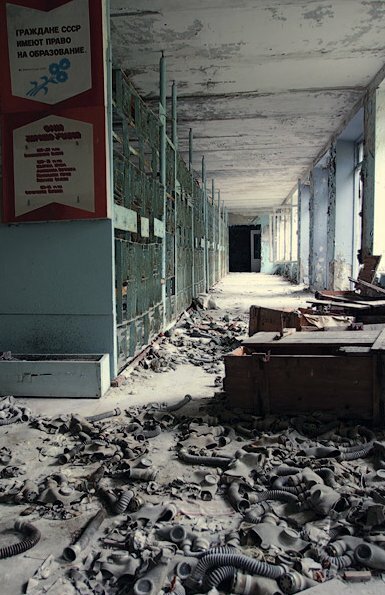 I didn’t see it in person but there is a corridor in the Pripyat school choked with hundreds of child-size gas masks. They were originally stored in crates in the basement in the event of nuclear entanglement with the US. Looters brought them up out of the basement and systematically striped them of the silver filters. Another radiator that managed to escape the looters! Of course, Kid of Speed (Elena Filatova) came up. “Oh that; it’s a hoax!” declared Rimma, though I’m not sure if “hoax” was the right word. Basically, Elena took the tour with her husband a couple of times. They brought a motorcycle jacket and helmet and periodically, she would pose and her husband would photograph her wearing the jacket and holding the helmet. This was curious behavior but the guides soon figured out what was up once the story went up online. Rimma laughed as she talked about it; I got the impression that she was asked about Elena by every single tour group she had ever had. Ve-ry interesting. Apparently Elena is not the maverick (ahem) motorcycle warrior explorer of post apocalyptic wastelands, docimeter and trusty overpowered bike at her side, that her site leads us to believe. I took another look at her photo essay and in fact, all photos of her with the bike in the picture were taken in obvious places outside the zone (we passed many of them on the route in). Inside the zone, no bike. And she obviously had a passenger. Rimma told us that no open vehicles were allowed in the zone because of the danger of inhaling radioactive dust. Rimma even said she thought Elena’s husband wrote the essay though I don’t know why. Personally, I don’t care really aside from the fact that I find it highly interesting that the solo chick cyclist angle was totally fabricated. I would go so far to say that her fascinating and dramatic photo essays single handedly inspired the interest and solicited the sympathy of hundreds of thousands around the globe for a disaster that had all but been forgotten. I highly recommend a look at her site if you haven’t seen it before. And while I’m on the topic of debunking popular culture, let me say a few words about Martin Cruz Smith’s Arkady Renko novel, “Wolves Eat Dogs .” Our guide Rimma had a LOT to say about his book. She hated it, basically, and ranted at length about it. Personally, I don’t think she was able to read it as a work of dramatic fiction; rather, she read it as a critical look at her world and her friends and her life. An in her opinion, the critique was not favorable. The kicker? She (and the other guides) believes that Martin Cruz Smith never even came to Chernobyl at all. This was the point that I found very curious. I had only recently gone to a book reading (I’m, um, a fan of the cheesy detective action anti-hero genre, cough) and was pretty damned excited when this book came out. We got to the bookstore early like good little groupies, dutifully listened to the reading, watched in rapt fascination as he gave a slide show of photos of “his” trip to Chernobyl, and stood in line to get our book signed. From his talk, he implied that the photos were in fact his, that he had lined up some something-something nudge-nudge wink-wink under the sly and got himself a little tour-de-roo to this wacky place that most would not consider visiting in a million years (well, not for 600 at least). Indeed I find this case of Mr. Smith’s Chernobyl visit highly entertaining; however, I’ll shut up now and get on with more photos. Another interesting video is this one showing the liquidators, including footage of work shoveling graphite off the roof of the reactor, running to dump pieces down in the hole before their minute was up. You can see how grossly inadequate their protective gear was in the video; it looks like the face masks are made from cloth or maybe paper. Some of the footage shows the men not even using the masks (they said it was hard to breathe with it on; obviously they were not aware of the extreme danger). They wore the coveralls and masks day in and day out, wearing them home on the busses to their camps (there were huge tent camps around 15 km away or so from the reactor), then putting on the same dirty coveralls the next day to go work at the reactor. I saw a photo of this same room just after the evacuation and all the beds had mattresses and bedding. I wonder what happened to them. Reused? Buried? One room the we saw has solitary gas masks lying here and there, next to a crushed toy, dangling from a metal bed. I wonder who moved the masks here. A photographer trying to get a better photo op? I felt as if many of the scenes were ‘seeded’ so to speak. I still took the picture though. Ironically, most of the heart-wrenching photos of the mayhem in the kindergarten were left over from looters or workers clearing stuff out. These photos are from 2005 and since then, I’ve read that one of the apartment buildings has actually partially collapsed. Also, newer photos show a series of spray painted graffiti inside and outside buildings. They are attributed to Kostya Danilov, a graffiti artist who, with the help of a couple of others from Russia, Belorus, and Germany, painted the majority of the graffiti at Chernobyl. He said he went in with a design plan but most of the pieces that went up ended up being more inspired by the moment. He is now banned from ever returning. The little girl reaching for the elevator button, the silhouettes of people standing around, the child fishing, the black and white faces, the screaming head on the rooftop, these are his pieces. 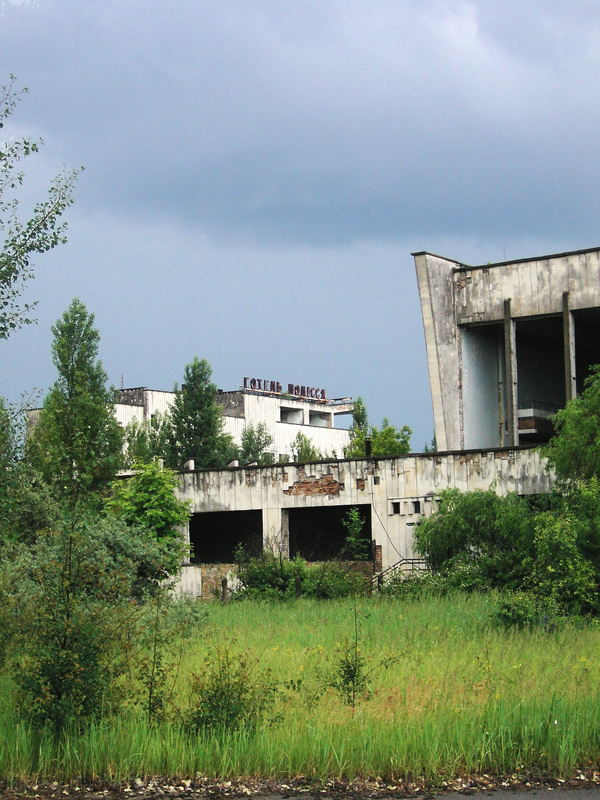 When our time in Pripyat was up, we got back in the van and returned to Chornobyl for lunch. This was included as part of the tour and it was pretty amazing. Our places at the table were set with an abundance of food: salad, borscht, a plate of cold cuts and olives, bread, water, compote (a Ukrainian juice made from steeping dried fruit with spices and honey—it is REALLY good), and then the main course, and then dessert. It was an insane amount of food and it was all incredibly delicious. We did not need to ask but yes, food in Chornobyl is brought in from the outside. During the lunch, Rimma ranted again about Martin Cruz Smith’s book, “Wolves Eat Dogs.” “He acts like we are all alcoholic fatalists living here; everyone a crazy misfit with a death wish. I know he must never have been here because he described this place as probably serving local food and the servers being ghastly ‘heavily made-up circus performers.’ I mean, LOOK AT THEM! Are they heavily made up? Are they coarse or brusque? Those women are the nicest, timidest, sweetest people in this entire place!” And indeed they were sweet and timid. Rimma was personally offended for everyone who lived and worked in the zone. After lunch, we dragged ourselves back out to the van and headed for the automobile graveyard. [Part III coming up soon!] — EDITED: Actually, we had a break-in and my laptop got stolen. On it was the almost-final draft of Part III and all the edited photos. I sort of haven’t gotten the gumption up yet to rewrite it and re-edit all the original photos. Sigh. Sorry about that all. I do still intend to get the photos up and the remaining story up eventually but for now… here’s Part I if you haven’t seen that yet. 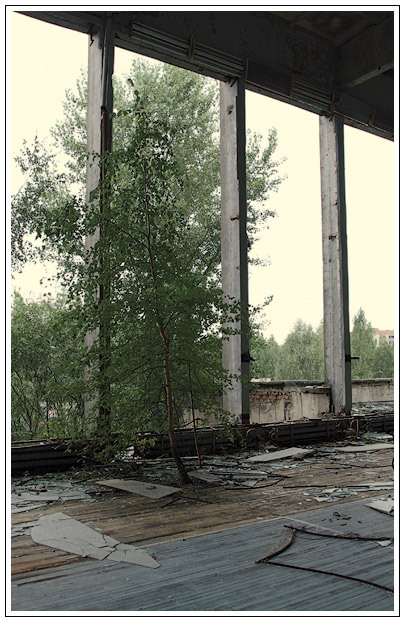 PS – I’ve read a number of books on the subject and these two were by far my favorites: Voices from Chernobyl: The Oral History of a Nuclear Disaster , and Wormwood Forest: A Natural History of Chernobyl . Highly, highly recommended. This entry was posted on Tuesday, May 12th, 2009 at 10:48 pm	and is filed under doings, Russia. You can follow any responses to this entry through the RSS 2.0 feed. You can leave a comment, or trackback from your own site. Thanks for part II. I’m so glad you are taking the time to write it up, even years later. You’re right about the scattered stuff making it look like a hasty and scary evacuation (which it should have been, actually). I had wondered about that after seeing the photos on Elena’s web site. But it does capture the mood of the whole thing in a way, as you said. I found myself wondering about people like Rimma, your guide, who are in the zone for long hours every day… How does that work? What sort of chemical shower takes off radiation? That does sound like something to avoid if you can. Looking forward to part II – I don’t know anything about the auto graveyard, but yeah, I suppose the cars had to go somewhere, didn’t they (besides as “hot” parts on the market). In fact I spent 4 nights at Chernobyl. Having just stumbled upon this, I thought it necessary to write that I found your photos and descriptions fascinating. What an interesting read, thank you ever so much! Profoundly revealing, I’m planning my trip to the city in two years time. I’m Australian and so spend a great deal of time explaining to my friends about the story of the disaster. My countrymen honestly think I’m insane for wanting go there in the first place. Aussies know next to nothing about it all, truly, they stare blankly at you when you say Chernobyl..especially if they are under about 25 years of age. Thankyou for your photo’s and essay. Very inspiring. If it’s ok with you, can I use your pics. for my school project? haha – Did Martin Cruz Smith google himself and find this page? And THEN find it necessary to post a comment? Awww…how cute! Fasinating! You are an incredible story teller. amazing. after so long can humans go in there safely? i doubt the russian government will let you though. the pictures are creepy and now i think japan will be subject to this. most of the reactors there will be buried under tons of metal and concrete. can I use some of these pictures for my school projet? thanks, i,m a schooler, can i use you intresting and wonderful pictres? Fantastic pictures and such an excellent writeup.